LARGO, USA – CS2 Series force testers from AMETEK Sensor, Test & Calibration are an excellent choice for plastic testing when accuracy, repeatability and documentation of results are important. They make plastic testing easy and offer a low-cost alternative when advanced material testing functionality is not required. The CS2 Series force testers can perform most commonly used tests within the plastic industry from basic static force testing to multistage testing, cyclic testing and more at a fraction of the cost of an advanced materials tester. CS2 Series force testers feature a large working area of up to 180 mm that allows the operator to not only test the plastic product but its packaging as well. The CS2 Series is available in two load capacities with the CS2-225 for testing up to 1 kN (225 lbf) and the CS2-1100 for testing up to 5 kN (1100 lbf). 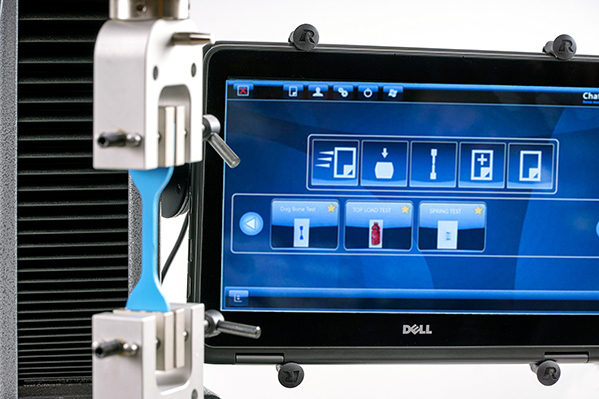 Both force testers provide operators with an intuitive, easy-to-use touch screen console. The user interface makes performing tensile testing, compression testing, flexural testing or advanced multi-stage testing that conforms to ISO or ASTM standards a breeze. The large, robust touch screen tablet is simple to operate and offers tabular and graphical results along with embedded statistical process control. Frequently used tests can be displayed on the start-up screen for immediate testing. Data can be displayed on screen or easily exported. Test results are stored as CSV files and can automatically be exported to a USB device, a local or remote drive, via an Ethernet connection or Wi-Fi communication. The results also can be exported via RS-232 ideal for production. The CS2 Series is a self-contained, fully operational system that requires no propriety software or knowledge of programming language to operate. For improved security, the CS2 Series force testers feature two levels of user access, which can be password protected. Chatillon is manufactured by AMETEK Sensor, Test & Calibration (STC) in Florida, USA. AMETEK STC offers a comprehensive line of force testing instruments and materials testing equipment for plastics, rubber, food, medical devices, textiles and packaging. To learn more visit www.ametektest.com.